Hi we are Craig and Kelly. We are looking for a live in house and or pet sitting job in the Salt Lake Valley, Utah. We do not require payment if we live in your home while we house sit for you. We have been house and pet sitting in Australia for the past year and we are about to move back to Utah. We are tidy, respectful, non smokers, Empty nesters and we have police checks in both Australia and Utah. 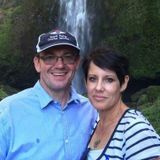 Craig has an online home business that he runs and Kelly is an Interior Designer and will be continuing work at Thomasville Utah in Murray. We are previous home owners before we started travelling between Australia and the USA & love gardening. We will be back in Utah early May and are looking to house sit as soon as possible. We would prefer long term House Sitting if possible. We have just won the Greencard Lottery and are very excited to be moving back permanently to Utah. We had lived in Utah for 3 years between --... before returning to Australia. We are happy to help with pool maintenance, lawn maintenance and gardening, snow clearing, Feeding, walking, caring for and loving pets. We are not able to look after cats as Craig has allergies. We have experience looking after dogs, chickens and alpaca. Craig grew up on acreage and has had lots of experience with cows, chickens, geese and turkeys. We also had our own dog for 12 yeas.